i posted this on several boards a couple years ago. some of the prices may be outdated but the info is still good. i started reloading ammunition for my rifles and pistols about 20 years ago. at the time i wanted the ability to produce my own ammunition after TSHTF (yes, i was a survivalist even way back then). to that end i wanted to be able to make as many of the components as possible. i learned how to make my own primers as well as reload commercial ones, as well as make my own powders, both black powder and smokeless. one thing i wanted to be able to do was make my own brass, but the start up costs are prohibitive. what i COULD do, and started doing right from the start, was cast my own bullets. 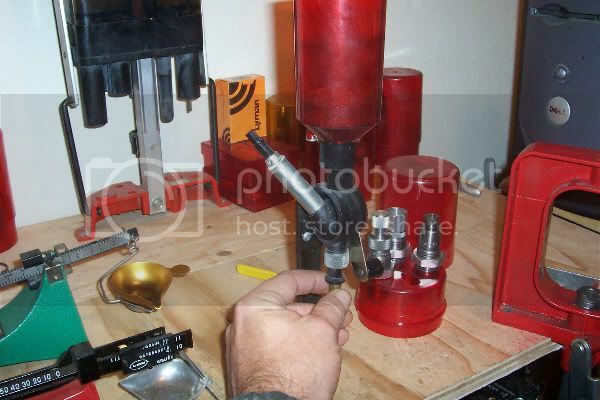 in this article i will be covering both reloading as well as casting for both rifles and pistols. i will be discussing the equipment i know best, the majority of it from Lee Precision, and hopefully, giving enough information for those out there who've thought about getting started but didn't know how. i know there are a bunch of reloaders on the board and, if any of you would like to add your experiences to this thread, please feel free. we can all learn from the experiences of others and different points of view will give the beginners more options. i do ask however that we don't get into debates or arguments over details that don't really matter. this thread is intended to help newbie's get started and confusing them isn't helpful. with that, i'll start this off with a discussion and links to the different reloading set ups necessary to get started. 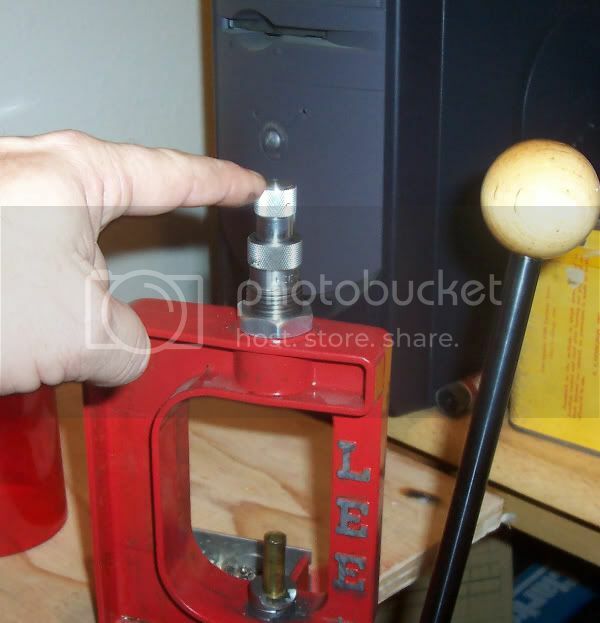 as i said, i prefer Lee Precision for reloading equipment. 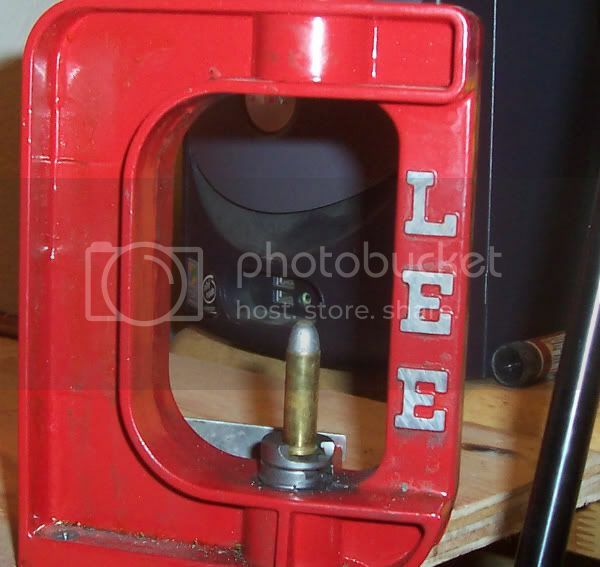 Lee has been in the reloading business longer than anyone. they make simple, practical equipment designed to do the job well. they don't have some of the frills others do but, when you consider that the most expensive start up kit they have is less than the press alone from everyone else, you'll see that you simply won't be paying for stuff you don't need. 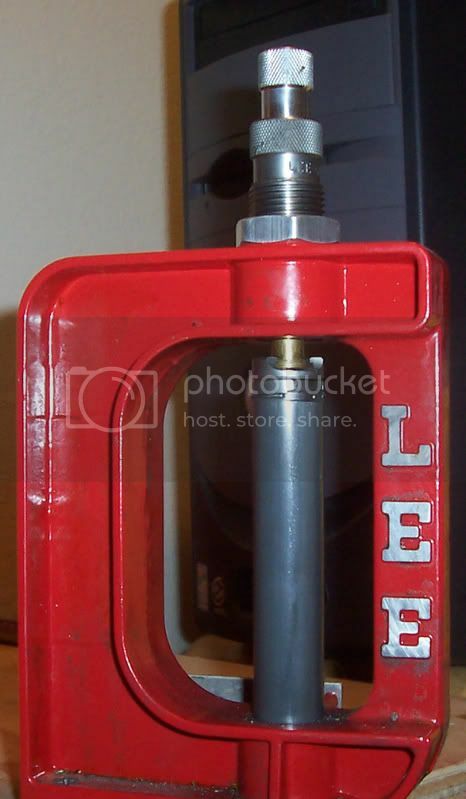 i personally have been using the single stage 'challenger' press from Lee for the past 20 years and it's never let me down. it's still good for at least as many years to come, as is all the equipment i've used from them. the ammo i produce is of the highest quality, at least as precise as that turned out by other brands. 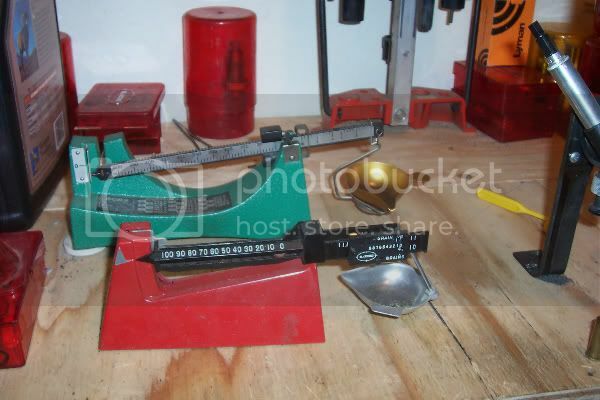 in fact, i have been loading match quality rifle ammo on it for some years now. some of the other presses like dillon and rcbs may indeed be strong enough to pass down to your grandchildren, but for my money, i'd rather just buy them their own set from Lee. 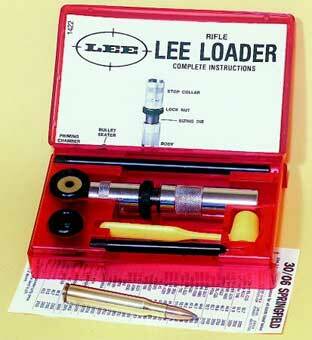 the first complete reloading set ever offered for sale was the Lee Loader (now called the Lee Classic Loader). 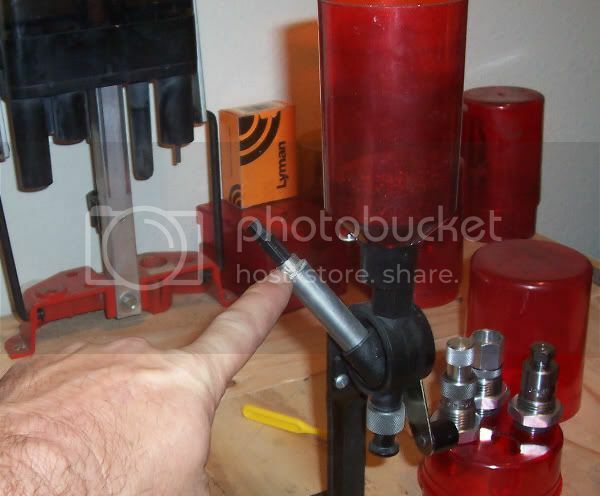 this is still the cheapest way to get into reloading. it's simple to use and has the ability to turn out high quality ammo, but it's also one of the slowest reloaders made. it has been said that if you're not sure you want to get into loading your own or if you only want to reload a box or two at a time, these kits are perfect (they're perfect for packing in a BOB as they are the smallest and lightest kit available also). here's a pic of a typical Lee Classic loader. all you need to add is a hammer and the components (brass, primers, bullets and powder). most calibers require three dies to perform all the operations, plus a shell holder. Lee sells their dies for less than half the price of others and they include the shell holder along with a powder scoop and load tables, while others make you buy that stuff separately. also all of Lee's pistol dies have carbide sizing inserts. this is important because resizing brass wears away steel dies and eventually they'll be worn out, unless you lube the cases first. Lee's pistol dies don't need lube and will never wear out because carbide is so much harder than steel. unfortunately no one makes carbide rifle dies so lubing rifle brass is a must if you want to protect your dies. 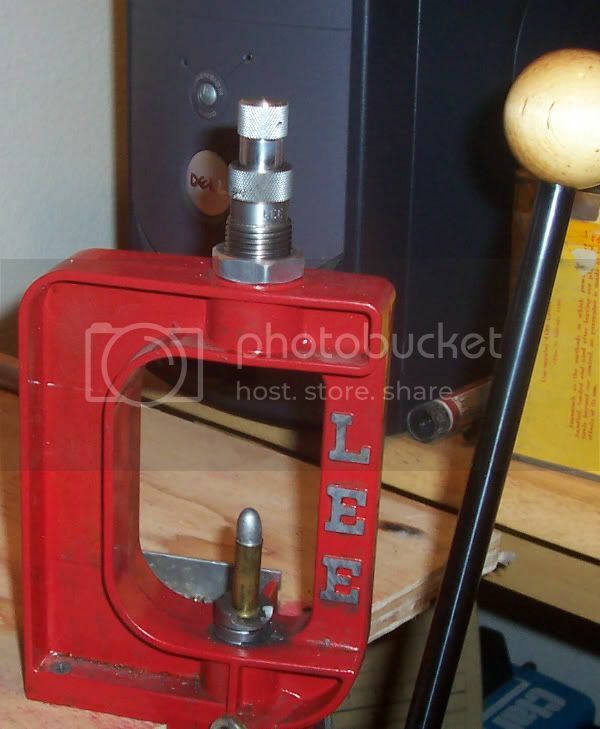 for a limited time lee still has their speed dies in most pistol calibers. these are GREAT for single stage presses and as a bonus have a carbide sizing die also. scroll down the page and look for 'speed dies' in your caliber, they're going for $20. the only way to do something really stupid when loading with a scoop is to decide that, if one scoop is good, two must be even better. seriously, while i was leary of scoops for years, after i started using them i found they're nearly as accurate. also a variation of .1-.2 grains won't make a big difference as long as you're not trying to load to max pressures to begin with. 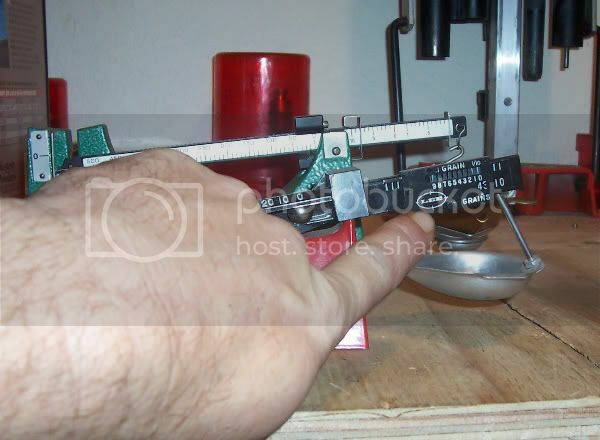 of course, if you MUST have a scale, lee makes one of them also, for around $30. this kit comes with everything necessary to start reloading, along with some items nice to have but not absolutely necessary (including the scale above). the only thing you have to add are dies and components. the powder measure is the most accurate in the industry (i have often loaded several thousand rounds without it varying by as much as .1gr. also included is a primer pocket cleaner, a hand priming tool that has been copied by several other manufacturers, a deburring tool and a case length holder and cutter combo (shell holder and length gauge sold seperately at midway for around $3 for each cartridge). and all this for less than $100. 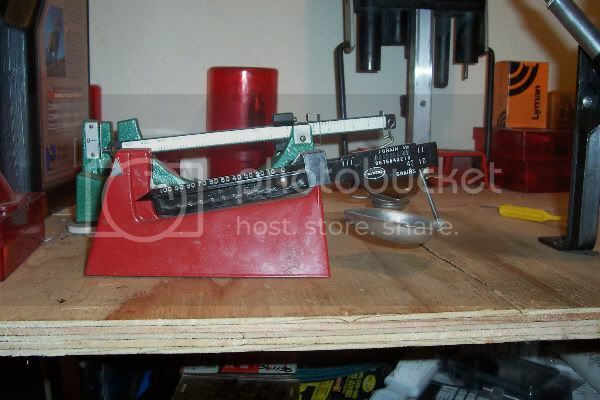 add a set of dies and components and you can get started reloading for less than $150. 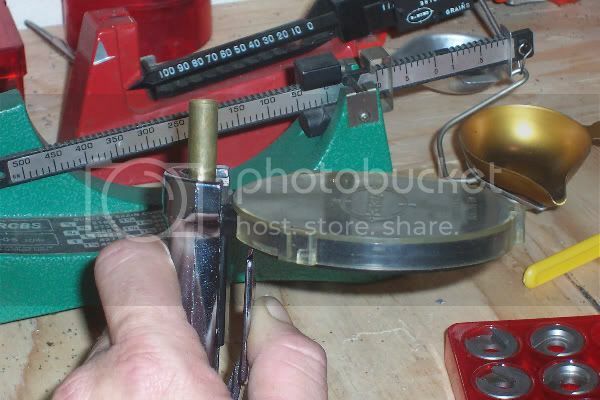 in the next post i will begin to cover the steps necessary to reload ammunition. for this demonstration i will be reloading a .38 special. the procedure is the exact same for any other cartridge when using a 3 die set. using the speed die requires a slightly different procedure, but i'll cover that later. before starting to reload the brass needs to be cleaned. 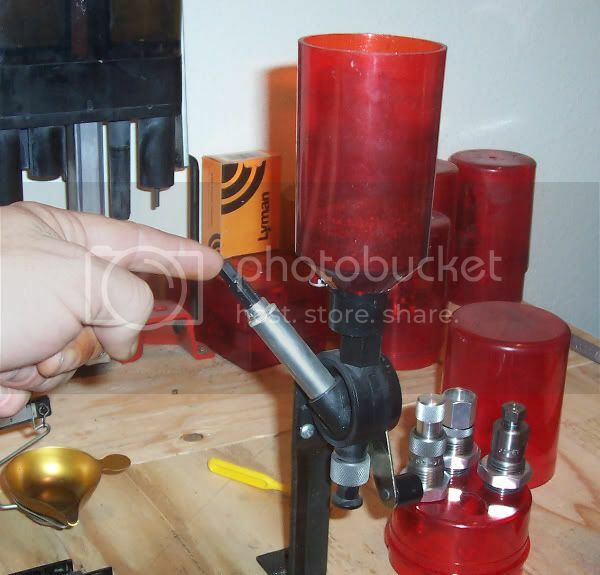 most folks use a tumbler to do this as it leaves the brass shiny. personally, i don't care if my ammo is pretty as long as it works as intended, so i simply wash it to remove any grit or fouling. when cleaning a load of brass i start by adding hot water (as hot as i can stand) to a coffee can. to this i add a tablespoon of laundry detergent and another tablespoon of degreaser. i then pour in not more than a couple hundred pistol cases (half that number for rifle cases) and begin to agitate them with my hands. after 5 minutes or so i pour off the water and rinse, again with hot water. finally i pour off the water and spread the brass on a cookie sheet and place it in the oven at 250 degrees for an hour to dry. once the brass is dry i can begin reloading. the first step is to get all the equipment i will need ready. 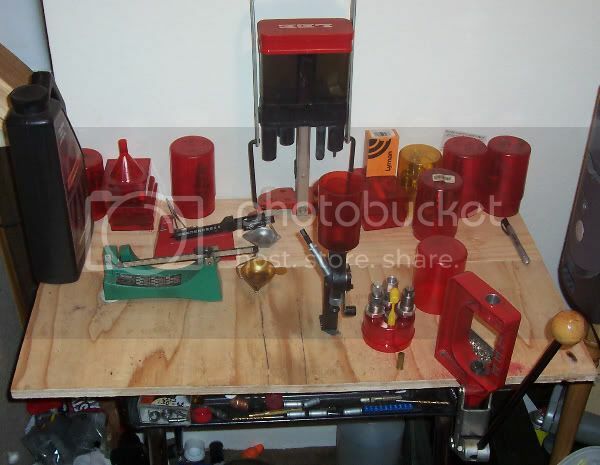 below is a pic of my loading bench with the proper dies ready to use. as a side note, for those living in an apartment as i am, this bench is quite compact yet serves all my needs well. it's actually built on an old school desk i salvaged. on the back side is my Lee Loadall II shotgun press. in the three die set the first die that is needed is the sized/depriming die. this has a pin sticking out the bottom to remove the old primer. to install it, place the shell holder on the ram and raise it all the way to the top. 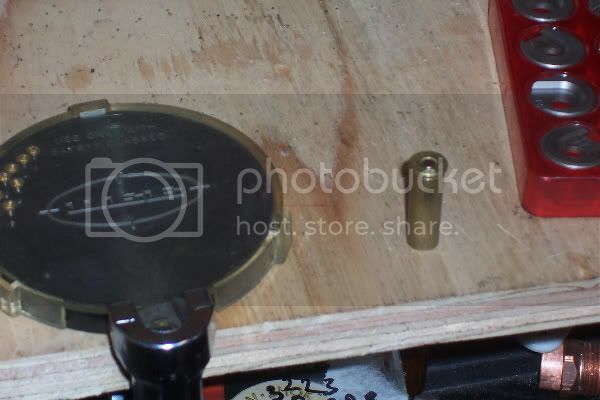 next, screw in the die until it touches the shell holder and tighten the locking ring. lower the ram, slide the base of the case into the holder and raise it to the top. the case should slide completely into the sizer. you will also feel and hear the old primer being removed. lower the ram and replace the case with another. repeat these steps until all of the brass has been processed. next we need to prime the brass. if you purchased the anniversary kit you will have a priming tool included (for those with a ram prime, refer to the instructions included with the tool). to use the lee hand priming tool, first ensure that you have the right sized tray for the primers you are using, in this case, small pistol. remove the clear cover from the tray and carefully pour up to 100 primers into the tray and gently shake it from side to side until all the primers are facing upwards. replace the lid. next, select the proper shell holder from the collection included with the kit. it will have the same number as the loading shell holder installed on the ram. depress the tray slightly and slide the holder into place, allowing the tray to rise again and lock it in place. finally, slide a deprimed case into the holder and tip the tray so the primers slide towards the case. when you're set gently but firmly squeeze the handle. you will feel the primer seating. after the priming tool stops moving release pressure and remove the case. if it will not come out tip the tray to remove primers from the shell holder and press the case again, harder. after the case is removed slide your finger over the primer. it should be set slightly lower than the brass. with a little practice you will be able to do this by feel. prime the rest of the brass before going on to the next step. now we're ready to flare the case mouth. this is done to help ease the bullet into the case. the die to use will be hollow all the way through (this is to allow powder to be added if the die were being used with a progressive set). in this case we'll be adding powder seperately. to install the die place a case in the shell holder and raise the ram all the way up. screw in the proper die until it just touches the case mouth, then another full turn. tighten the locking ring and proceed to process all the brass. when properly flared the case will be noticeably wider at the mouth when you slide your fingers over it. now we add the powder. first we need to find the right powder and load. consult the load data book (you did buy a book, right? my bad, i forgot to tell you to do that. it's ok though, midway has them. most reloaders have several, but to get started any of them will do). look up the cartridge you're working on and consult the tables until you find the one for the weight bullet you're using. the bullet they describe may not be identical to what you're using, but the only really important thing is that the weight is the same. scan down the table and find a powder you have in stock and then look for the minimum weight of powder listed. in my case i will be loading 4 grains of ramshot zip under a 125 grain cast roundnose bullet. 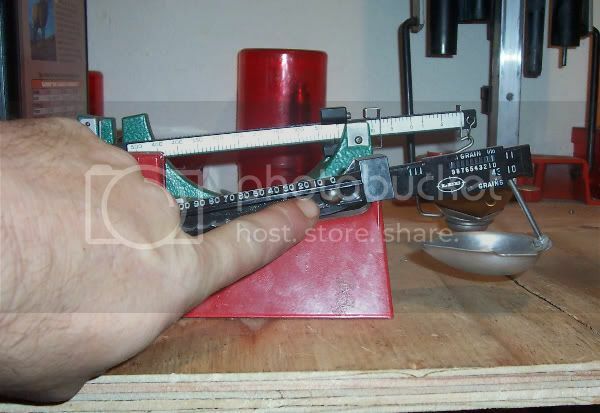 once you have the load, pour the selected powder into the powder measure and set the scale for the load you selected (to zero the scale before use set all indicators to zero and, with the pan in place, screw the brass knob in or out until the scale balances). the ball bearing in the arm sits in recesses for every 10 grains. in this case it is set in the zero spot. the slider is moved until the number of grains is selected in the window and the hash marks indicate the 1/10th grain setting. next the powder measure is adjusted. screw the black stem in or out and weigh the results until you get the scale to balance. finally, lock down the ring on the stem. now, we begin the final stage. 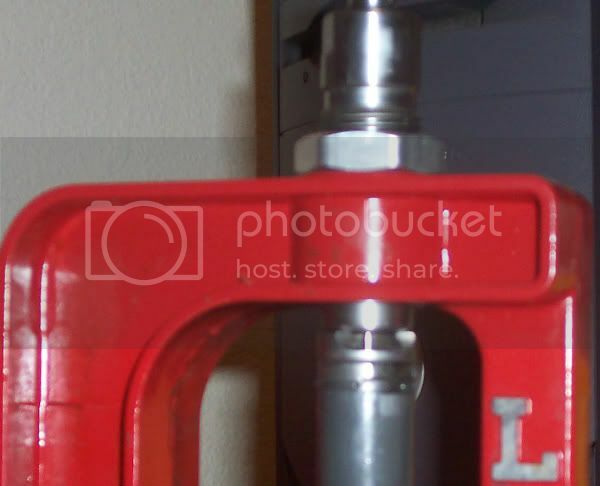 install the last die in the press by putting a case in the shell holder and raising it all the way up, then screwing the die down until it barely touches the case. 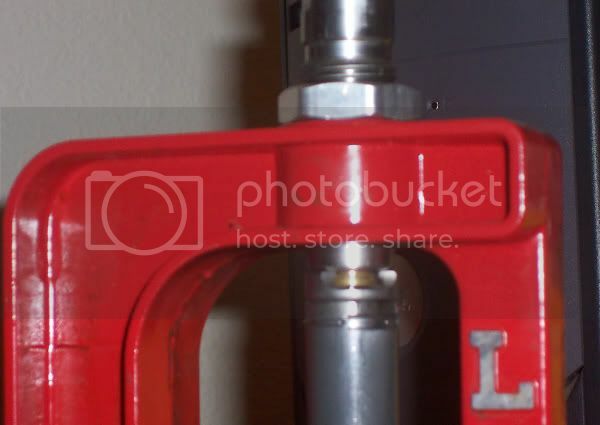 set the locking ring. 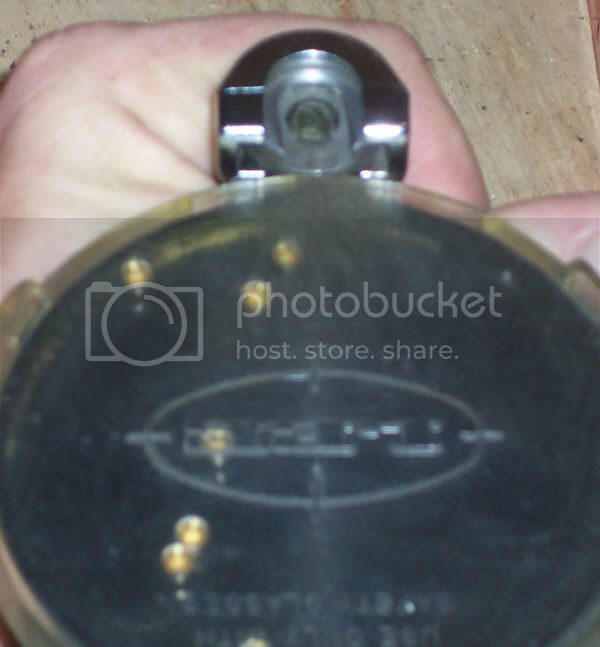 once the die is set screw the bullet seating knob (under my finger in the post above) at least a half inch out. place the case under the spout of the powder measure and work the lever up and down. place the case in the shell holder on the ram and place a bullet in it's mouth. raise the ram and screw down the bullet seating knob until it touches the bullet. lower the ram slightly and give the knob a twist tighter, then raise the ram fully. lower it again and check the seating depth. repeat this until you have the bullet seated to the depth you want. once you have the die set to the right depth back it off half a turn. loosen the locking ring on the main die body and screw it half a turn tighter. 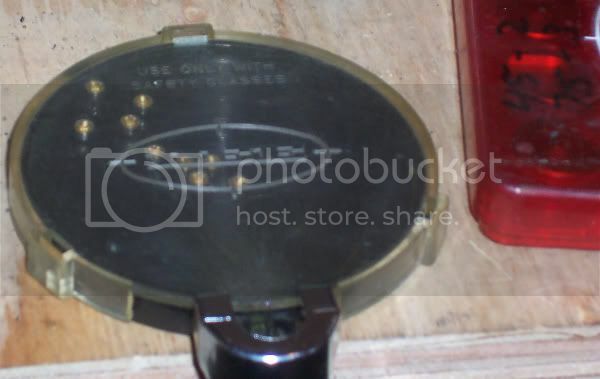 this allows the die to now set the crimp on the case. retighten the locking ring and proceed to powder the cases and seat the bullets. you have now successfully loaded your first ammunition. go out to the range and burn through it so you will have more to reload! wow, thanks CFI for this. I am sure it will help many! I save a huge amount by reloading. Average price on 100 rounds of .45 at wal-mart is $30...I can re-load that same 10 for $7-$12. No, you're not my father. I just started reloading myself. Last week I shot the first 20 308 rounds that I rolled. They all went bang. None went kaboom. I guess I did ok. Anyone know anything about using 224-308 cal sabots? I picked up some of those and want to try them out but I only have load data for 55 grain bullets. I've got 50 and 62 grain bullets I'd like to load, but I'm not comfortable with experimenting yet. you can get velocities pretty high without over pressuring the rifle when using sabots but accuracy tends to be bad as the sabot doesn't spin the bullet as fast as direct rifling contact. on a side note, i also load what are called 'cat sneeze' rounds for my bigger rifles. these are low recoil, low report rounds designed for varmint hunting. i load a .310 round ball on top of 8-10 grains of pistol powder with a filler to take up space. i get pretty good accuracy out to 100 yards in my K31 and my M1 garand. good enough to take a rabbit and without tearing up the meat like a regular round would do. tom, by casting my own boolits i can load .45 acp (or .38 spl) for around .03 cents a round...$3 for 100.
i also load what are called 'cat sneeze' rounds for my bigger rifles. My friends and I call those Bunny Farts. I'm moving this to 'How To' and making it sticky. Finally ordered my first reloading equipment today. I priced out a crazy awesome $2,000 setup, but decided to buy a hand press setup first to start off on. I spent about $185 total. And also ordered "L.E. Wilson Case Length Headspace Gage 308 Winchester" from Midway for $30 shipped. I picked up over 2,000 pieces of once fired Lake City brass for $220 shipped from some guy online. It has already been cleaned, so I can hold off on the tumbler for a little while. Next I'm going to place an order with Powder Valley for components. Oh, I need a handbook too! 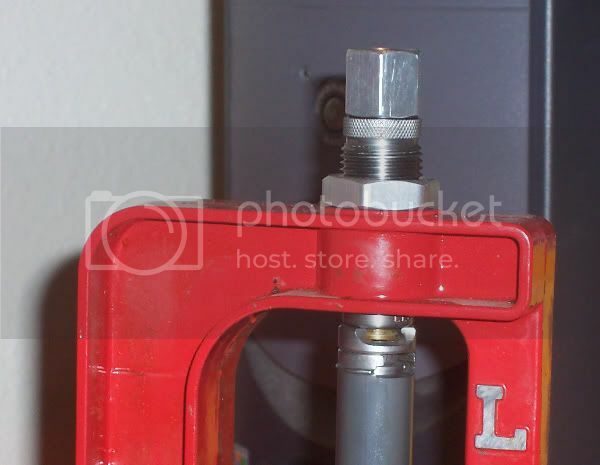 Your well on your way and that gauge will be handy when you have to start bumping back the shoulder on your brass 0.002" after maybe 3 firings or so. I forgot to mention that I also got one of these scales for free as a hand-me-down from a friend. That's why there's no scale in the stuff I ordered today. Can't beat that price! I'm going to focus on a low quantity of precision .308 loads for now, then upgrade my equipment so that I can crank out cheap .223 at a faster pace. I'm going to order Sierra MatchKing 175 Grain BT HP bullets first. My plan is to order a wide variety in low quantites at first, then when I find something that shoots the best without breaking the bank, I will stock up on it.